4 CD AND 1 DVD. This four CD/ 1 DVD collection tracks Jimi's incredible journey from R&B sideman to international acclaim. This collection presents - for the first time - the most sought after of Jimi's pre-Experience recordings as a sideman for such Rhythm & Blues stars as the Isley Brother, Don Covay, Little Richard and others. All of the misinformation and fake purported to feature Hendrix are swept aside for fans. The remaining three discs feature previously and commercially unavailable studio recordings from every chapter of his career, live recordings with the Experience and Band of Gypsy's spanning 1967 through 1970. 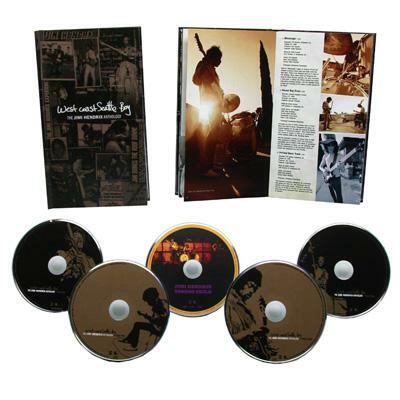 The DVD features Jimi's life story told in his own words. Legendary funk bassist Bootsy Collins brings Jimi's words and story to life. Rare and never before seen footage and photos; as well as the Hendrix family archive of the late guitarist' personal drawings, postcards home to his father, song drafts, sketches, lyrics are all featured in this special 90 minute presentation. 02． "Don Covay: Mercy, Mercy "